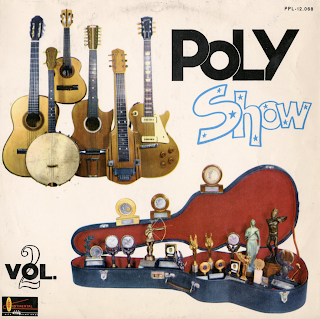 Nice period Latin set featuring varied, peppy sounding arrangements and a band backed by a strong rhythm section. 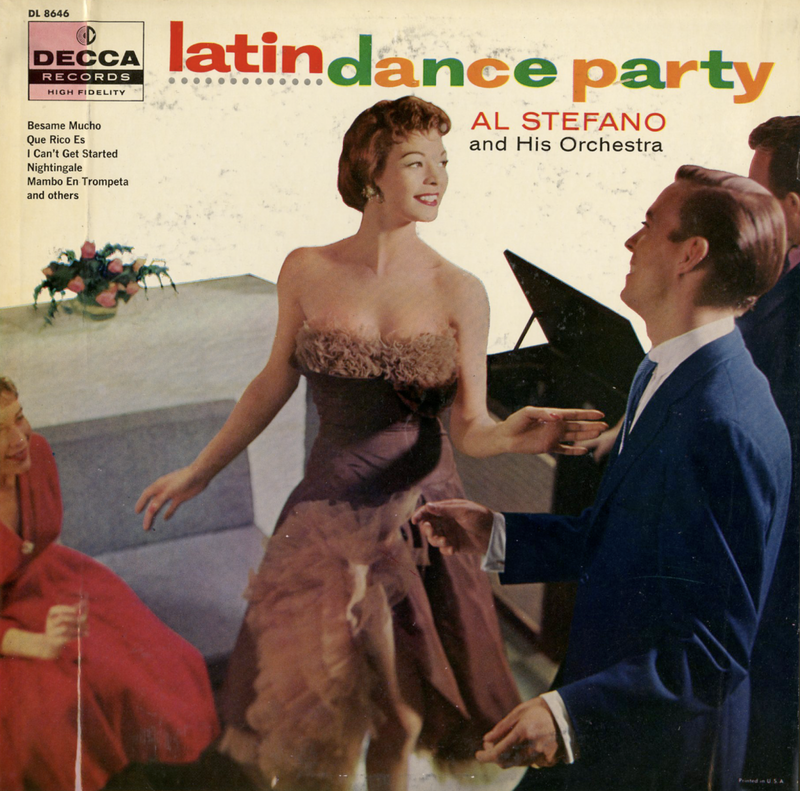 From the back cover: Al Stefano is a musician who from the onset of his career has had a strong belief in quality. He has expressed this belief by being a tremendous admirer of the one and only Perez Prado. 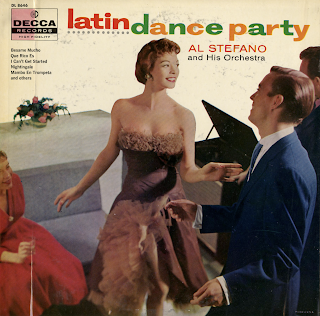 Beginning as a drummer, Al formed his own orchestra but three years ago, and is already firmly established as one of the leading Latin American dance bands. 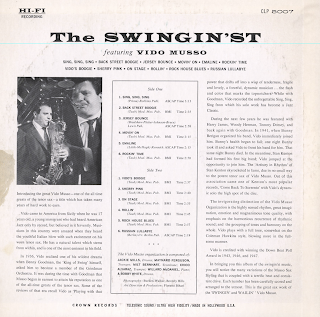 From Billboard - September 22, 1956: Musso, one-time tenor sax star with several big bands in the Swing Era, plays here like an inferior rhythm and blues honker. Customers attracted by nostalgia will be disappointed by the coarse, uninventive blowing. They will be intrigued by some amazing double-talk in the liner notes, however. 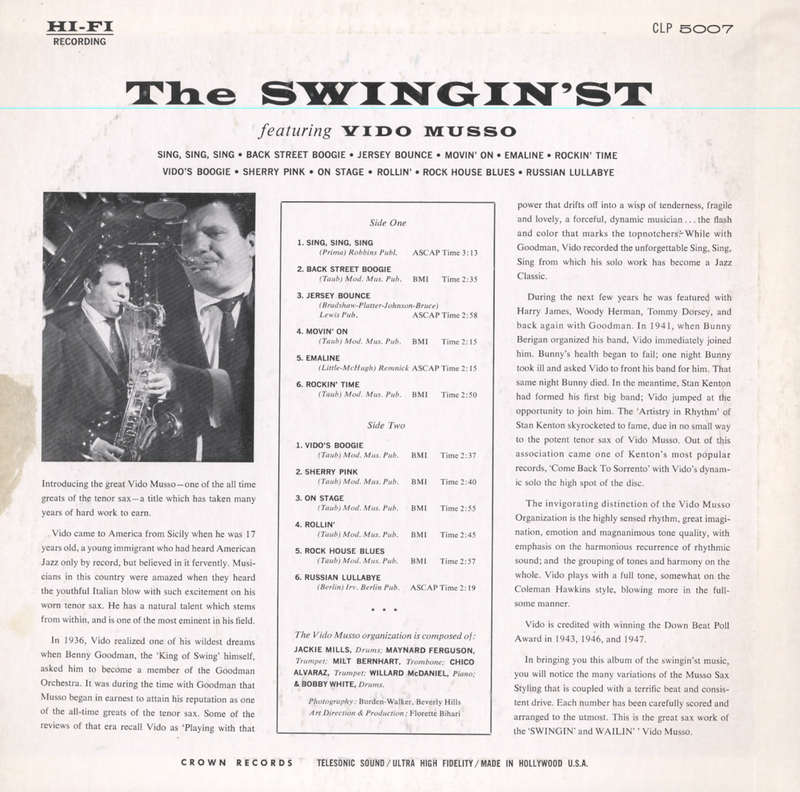 From the back cover: Introducing the great Vido Musso – one of the all time greats of the tenor sax – a title which has taken many years of hard work to earn. Vido came to America from Sicily when he was 17 years old, a young immigrant who had heard American Jazz only by record, but believed in it fervently. Musicians in this country were amazed when they heard the youthful Italian blow with such excitement on his worn tenor sax. He has a natural talent with stems from within, and is one of the most eminent in his field. In 1936, Vido realized one of his wildest dreams when Benny Goodman, the 'King Of Swing' himself, asked him to become a member of the Goodman Orchestra. It was during the time with Goodman that Musso began in earnest to attain his reputation as one of the all-time greats of the tenor sax. Some of the reviews of that era recall Vido as 'Playing with that power that drifts off into a wisp of tenderness, fragile and lovely, a forceful, dynamic musician... the flash and color that marks the topnotcher. While with Goodman, Vido recorded the unforgettable Sing, Sing, Sing from which his solo work has become a Jazz Classic. During the next few years he was featured with Harry James, Woody Herman, Tommy Dorsey, and back again with Goodman. In 1941, when Bunny Berigan organized his band, Vido immediately joined him. Bunny's health began to fail; one night Bunny took ill and asked Vido to front his band for him. That same night Bunny died. In the meantime, Stan Kenton had formed his first band; Vido jumped at the opportunity to join him. 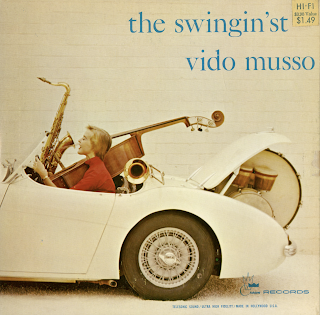 The 'Artistry In Rhythm' of Stan Kenton skyrocketed to fame, due in no small way to the potent tenor sax of Vido Musso. 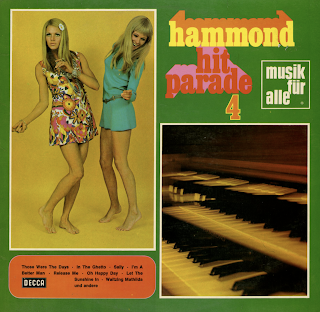 Out of this association came one of Kenton's most popular records, 'Come Back To Sorrento' with Vida's dynamic solo the high spot of the disc. Video is credited with winning the Down Beat Poll Award in 1943, 1946 and 1947. From Billboard - October 16, 1961: Matt Monroe a highly personable young Britisher, opened his initial American club engagement at the Roundtable here Monday (2), to the accompaniment of an augmented 12-piece band and considerable enthused reaction from the customers. 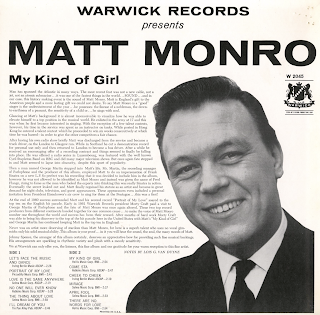 Monro, who has often been compared to Sinatra, Darin, Damone etc., particularly due to his performance on his recent disk hit on Warwick, "My Kind Of Girl," reveals a pleasant singing personality of his own. His repertoire consists mainly of nice, memorable standards like "Let's Face The Music And Dance," "Like Someone In Love," "It's All Right With Me," "Like Someone In Love," and "The Party's Over," and he turns these in polished fashion. The chanter also does a neat turn with "My Kind Of Girl," and his newest disk "Why Not Now," which is already getting good action in some territories. From the back cover: Glancing at Matt's background it is almost inconceivable to visualize how he was able to elevate himself to a top position in the musical world. He enlisted in the army at 17 and this was when he first became interested in singing. With the exception of a few talent contests, however, his time in the service was spent as an instructor on tanks. While posted in Hong Kong he entered a talent contest which he proceeded to win six weeks consecutively at which time he was barred – in order to give the other competitors a fair chance. After having his own radio show briefly Matt was discharged from the service and became a truck driver, on the London to Glasgow run. While in Scotland he cut a demonstration record for personal use only and then returned to London to become a bus driver. After a while he received an encouraging offer of a recording contract and things seemed to finally be falling into place. He was offered a radio series in Luxembourg, was featured with the well known Cyril Stapleton Band on BBC and did many major television shows. But once again fate stepped in and Matt seemed to lapse into obscurity, despite this spurt of popularity. Then a man named George Martin stepped into Matt's life. Mr. Martin, the recording manager of Parlophone and the producer of this album, employed Matt to do an impersonation of Frank Sinatra on a new LP. 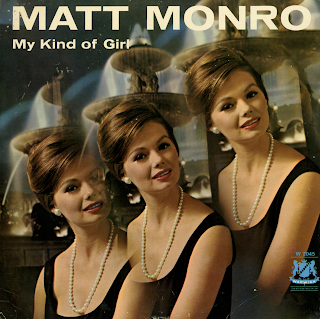 So perfect was his recording that it was decided to include him in the album, however, he was not allowed to be identified as Matt Monro and instead was given the name of Fred Flange, rising to fame as the man who fooled the experts into thinking this was really Sinatra in action. Eventually the secret leaked out and Matt finally regained his stature as an artist and became in great demand for night clubs, television, and guest appearances. These appearances even included a personal invitation from President Eisenhower's air crew to sing for them at the Pentagon... this was a first! Simple, classy "continental" sounding arrangements. 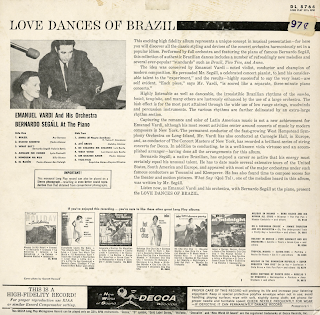 From the back cover: Bernardo Segall, a native Brazilian, has enjoyed a career so active that his energy must certainly equal his unusual talent. He has to date made several extensive tours of the United States, South America and Europe, and appeared with most of the major orchestras under such famous conductors as Toscanini and Klemperer. He has also found time to compose scores for the theater and motion pictures. 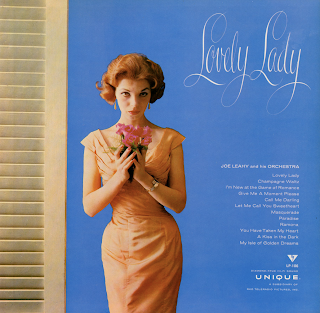 What Say (Que Gal), one of the melodies heard in this album was written my Mr. Segall. 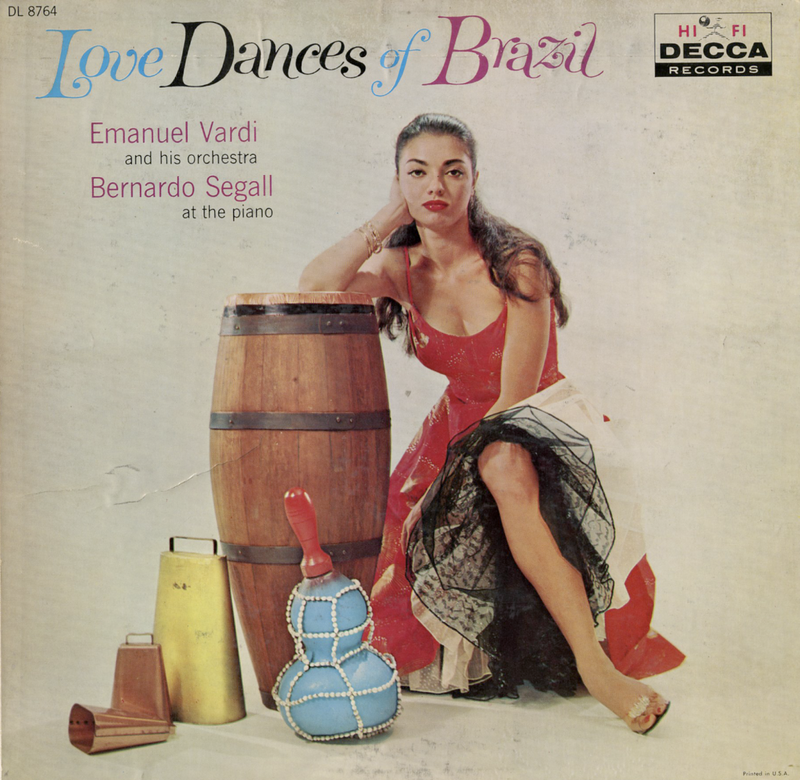 Capturing the romance and color of Latin American music is not a new achievement for Emanuel Vardi, although his most recent activities center around concerts of music by modern composers in New York. The permanent conductor of the fast-growing West Hempstead Symphony Orchestra on Long Island, Mr. Vardi has also conducted at Carnegie Hall, in Europe, and, as conductor of The Concert Masters Of New York, has recorded a brilliant series of string concerts for Decca. In addition to conducting, he is a well-known viola virtuoso and an accomplished arranger – having done all the arrangements for this album. Available from online vendors so I will not be posting a sample. Presented here because online examples may not feature the original cover art and to share the biographical information found on the back cover. 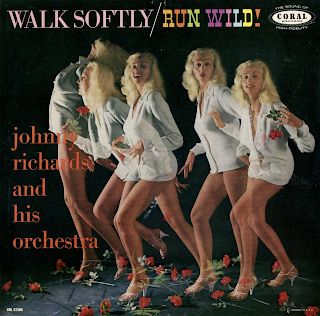 From Billboard - February 1, 1960: Richards is both smooth and dynamic in this fine offering of the big band brand of jazz. The arrangements are interesting and thoughtful, and they are well executed. The set has been well-recorded. Tunes include a few Richard's originals and some standards. Set is an excellent item for both pop and jazz jocks, and it should move for coin in both markets. From the back cover: Johnny Richards is a man of convictions. Though calm, polite and soft-spoken, he is a leader. In 1957, he organized an orchestra because he had to. "As long as I can remember, I have been a frustrated jazz musician," Johnny told critic Bill Boss shortly after his orchestra came into being. "I'd wanted to have an orchestra for some time," he informed me. "But I have been burned before, and it never seemed like the right time... It was Stan Kenton who gave me the final push. One day, he came up to see me a CBS and said:'John, you're a coward! Get a band. I know you want one. Why should I play your music when you can play it better yourself!'... That's all I needed... And by the way, Stan helped us get started. He's a wonderful man and so busy helping others. It's amazing that he has time for himself." The Richards orchestra broke in at the Red Hill in New Jersey. Dom Cerulli, then Down Beat's New York editor, praised it to the skies. Favorable and unfavorable comment followed in other publications. But it was Down Beat editor Don Gold who hit the nail on the head in a discussion of Richards and his music. 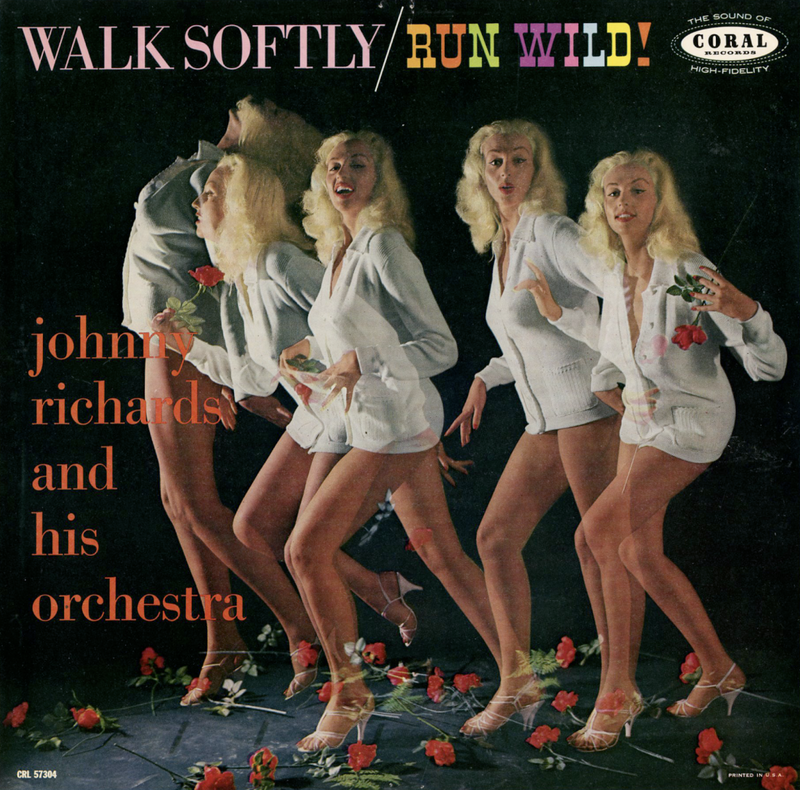 "Composer/arranger Johnny Richards, it seems to me, is one of the ablest men to serve as a leader. He manifests a creative discipline and integrity so essential to accomplishment." "Fronting a band of competent musicians," Gold continued, "musicians with definite solo potential, he manages to create an individualistic sound. It is a sound reflecting Richards' desires and musical aims..."
Richards' desires and musical aims out of an eventful, unclosed existence. The Richards family was tremendously musical; Johnny's older brother was a symphony bassist; his mother, a pupil of Paderewski. After studying at the Troy (New York) Conservatory for a short while, young John hit the road at eight and a half with a vaudeville show, playing banjo, trumpet, and violin. Back from the vaudeville wars, he devoted himself to study in upstate New York, (he later studied in New York and Chicago) and began orchestrating professionally at 14. Johnny literally bicycled through the so-called "tender years." In 1932, at 21, motion picture moguls in England showed a decided interest in the young composer/arranger. John accepted an offer from Gaumont Films and spent a year scoring their pictures. Returning to the U. S. in 1933, Richards went out to Hollywood to work at Paramount Pictures, serving as Victor Young's assistant. He stayed on to lot until 1940. Then the band bug hit him and John had a scalding experience. Five years were spent and much money lost. "One day in Chicago, in 1945, I broke up the band; I had had it!" he explained. Other mediums of expression were sought and found. In 1946, he became a contributor to the personality of the Boyd Raeburn orchestra. "This was a marvelous orchestra, a truly experimental unit," Johnny recalls. "I am especially partial to the edition that Boyd brought to New York to play at the Vanity Fair. Such great musicians sat in that band... 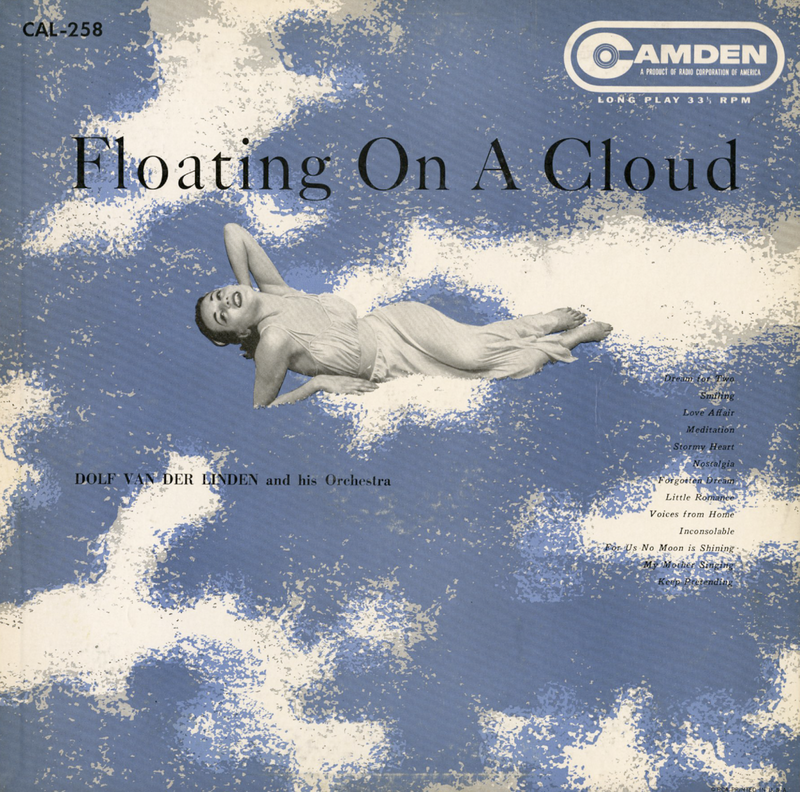 Buddy DeFranco, Conrad Gozzo, Wes Hensel, Irv Kluger, etc..."
Putting to work his then budding "orchestra concept," employing many instruments indigenous to the symphony orchestra, Johnny wrote a number of memorable, full-sounding, impressionistic scores o which Prelude To The Dawn and Man With A Horn are among the most valuable. "Around the time," Johnny went on, "I wrote some movie scores for pictures made in Mexico City and South America. The time spent in those places, and in Cuba later on, had a profound effect on me." 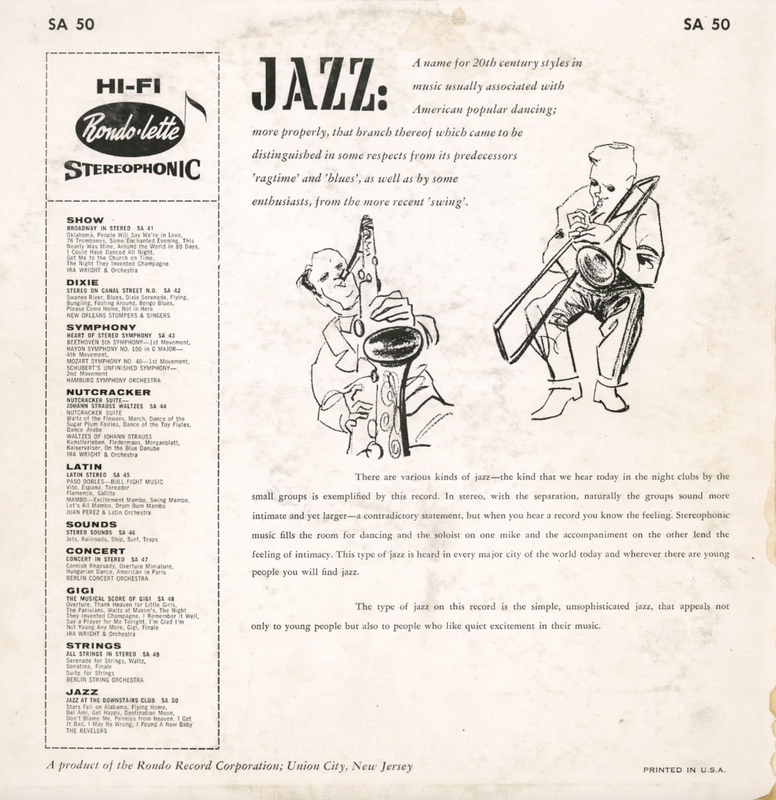 However, it was not until Richards came into the Stan Kenton organization in 1952, after more notable writing for Dizzy Gillespie, Charlie Barnet, Sarah Vaughn and Ella Fitzgerald, that the effect began to tell. His interest in Afro-Cuban rhythms culminated in the writing of Cuban Fire for Kenton in 1955, juxtaposing authentic Afro-Cuban rhythm against what Kenton has described as "North American music." This is a follow-up to another delightful Welles 1962 Columbia release titled Something Else, Songs Of Maids, Knaves and Other Swingers. 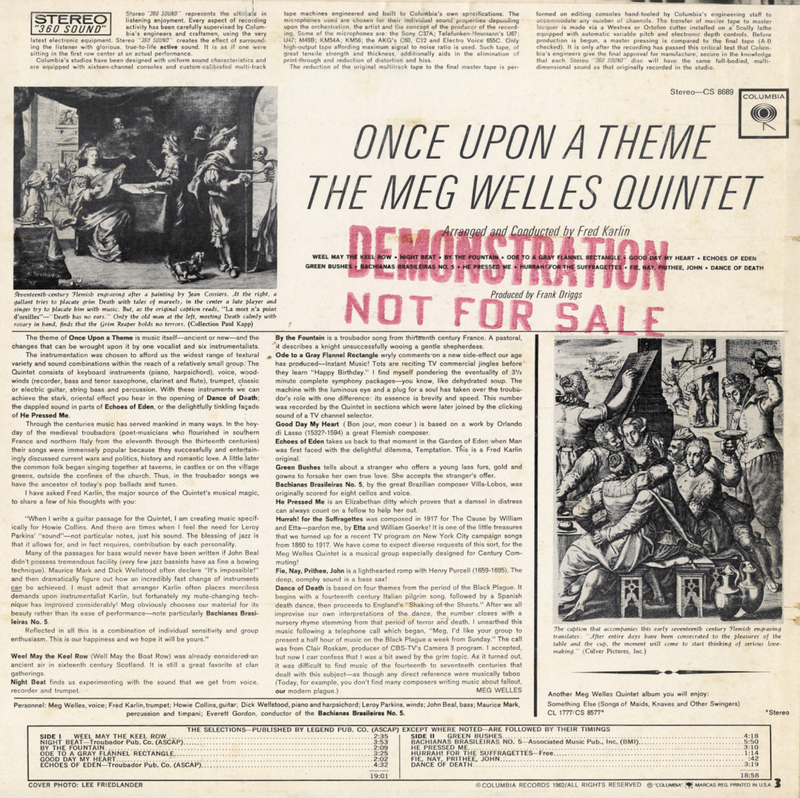 Both sets feature the group's engaging conceptual blend of "Medieval Folk" and modern Jazz sensibilities. From The Hollywood Album Discography: Strictly from Dixie [aka Dixieland Jazz] - Hot Rod Six Plus Two/Dixieland Five Plus Two  Album cover gives the group as the Dixieland Five Plus Two, while the label credits the Hot Rod Six Plus Two. Either way, the real band was The Cy Laurie Jazz Band. Because the label also has the working title, "Dixieland Jazz," even though the actual title of this album is "Strictly from Dixie," this album is sometimes listed as "Dixieland Jazz". 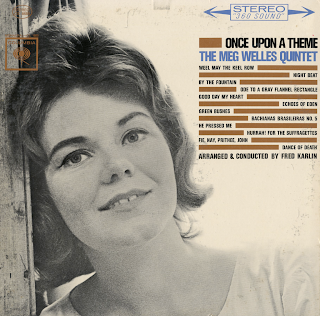 (This album may have originally been issued with a different cover showing the Firehouse Five Plus Two.) It was also issued as Westchester LPH-3. These songs were originally issued in 1955 on four four-song EPs by the Hot Rod Six Plus Two on the Gateway label (Gateway 9008-9011). From the back cover: A student of Maurice Fitzwarren of the Royal Farnsworth Orchestra School, Roy Freeman has received recognition from all of England's music critics for the fine mellow tone he achieves on his instrument. Notice the control on the unusual opening passages of Moritat. The ethereal qualities of the low register vibrato. Shades of Bobby Hackett. This is an album to be played and relaxed to. 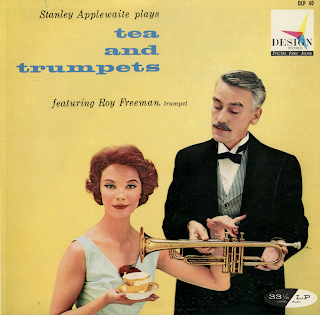 From Billboard - October 7, 1957: Routine pop item by English work with trumpet featured throughout. Program includes items possibly more familiar to English audiences than ours. The sound inclines toward an unpleasant "boominess" in spots but bargain-hunters won't wince. At the $1.49 price, it should have more than a few takers. 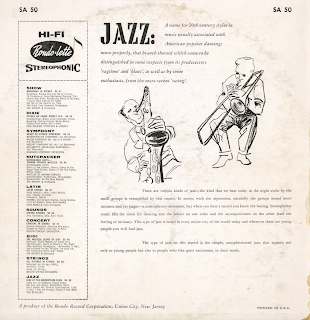 LP-106 was marketed in a 1956 issue of Billboard featuring different cover art. From the back cover: While still in his teens, with his high school diploma tucked under one arm, his one arm, his trumpet under the other, young Leahy left his home town of Boston to hi the road with a band, on a cross-country tour of one-nighters and theatre dates. Having worked up to the lead trumpet spot in the band, he was soon spotted by Les Brown, who hired Joe to play with his band. After a tour with the "Band of Renown," Joe joined Charlie Barnet's band, and later, Artie Shaw's. With the breaks steadily coming his way, the ambitious young musician formed his own orchestra with which he booked cross-country tours of big ballrooms, hotel circuits, college proms, and the usual one-nighters. During the years of the war, 1941-1945, Leahy's musical abilities were utilized by the Army. There he headed the Air Force Orchestra of the Air Transport Command, an orchestra of forty men. What with arranging and conducting for concerts, variety acts, and weekly CBS broadcasts for the Air Force (for which he wrote all the arrangements and conducted the orchestra), there was little idleness for Sgt. Leahy, whose chores also included a two-year world tour arranging and conducting music for variety shows featuring movie stars who entertained the troops. Trading khaki for blue serge, Civilian Leahy settled in the center of the music industry, New York, signed with CBS as a staff conductor-arranger, and went to work doing script-show music, background music for radio dramas and conducting the Sketch Henderson orchestra. A little over a year after signing with CBS, Joe decided to become a freelance arranger-conductor. In the following six years he wrote orchestrations for a hundred radio programs, including the longstanding favorite "The Breakfast Club" in Chicago. 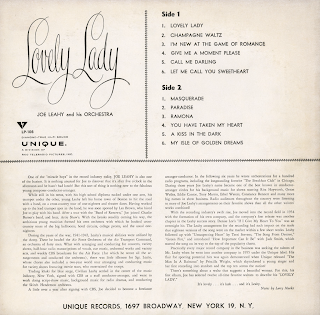 During those years Joe Leahy's name became on of the best known in conductor-arranger circles for his background music for shows starring Rita Hayworth, Orson Wells, Eddie Cantor, Tony Martin, Ethel Waters, Constance Bennett and many more big names in show business. Radio audiences throughout the country were listening to more of Joe Leahy's arrangements on their favorite shows than all the other writers' works combined! 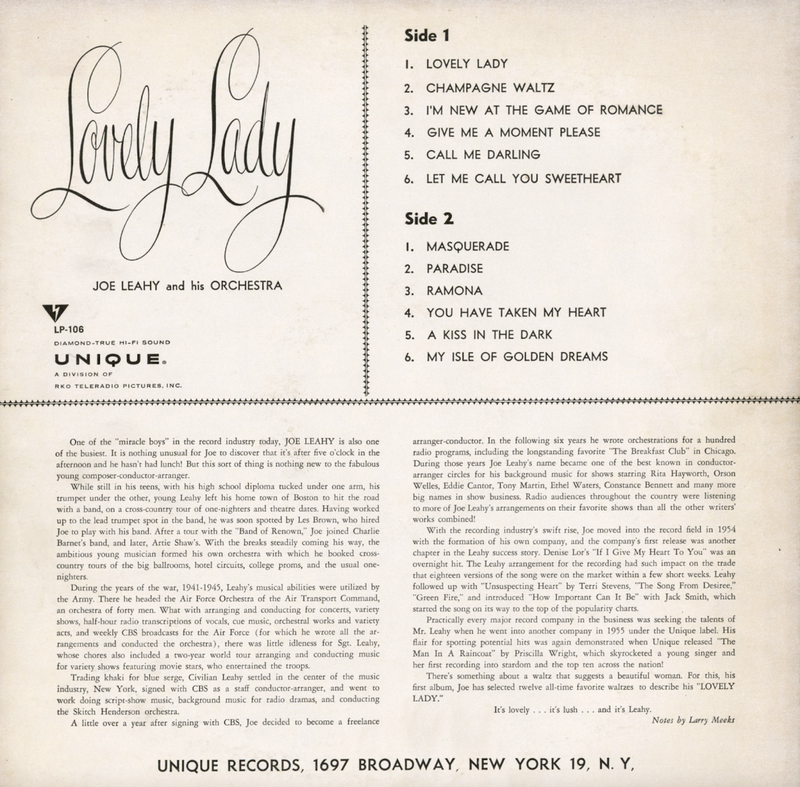 With the recording industry's swift rise, Joe moved into the record field in 1954 with the formation of his own company, and the company's first release was another chapter in the Leahy success story. Denise Lor's "If I Give My Heart To You" was an overnight hit. 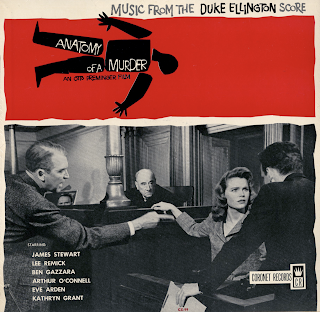 The Leahy arrangement of the recording had such impact on the trade that eighteen versions of the song were on the market within a few short weeks. Leahy followed up with "Unsuspecting Heart" by Terri Stevens, "The Song From Desiree," "Green Fire," and introduced "How Important Can It Be" with Jack Smith, which started the song on its way to the top of the popularity charts. 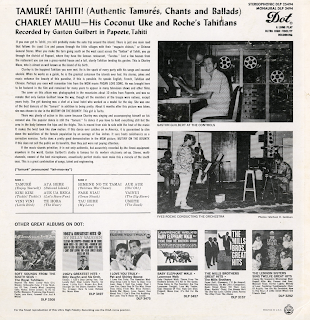 Practically every major record company in the business was seeking the talents of Mr. Leahy when he went into another company in 1955 under the Unique label. 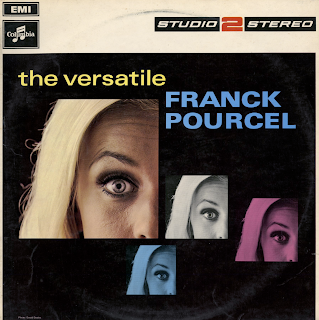 His flair for spotting potential hits was again demonstrated when Unique released "The Man In A Raincoat" by Pricilla Wright, which skyrocketed a young singer and her first recording into stardom and top ten across the nation! 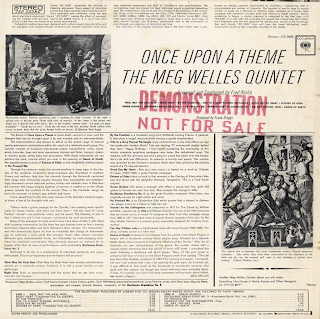 From the back cover: The type of jazz on this record is the simple, unsophisticated jazz, that appeals not only to young people but also to people who like quiet excitement in their music. 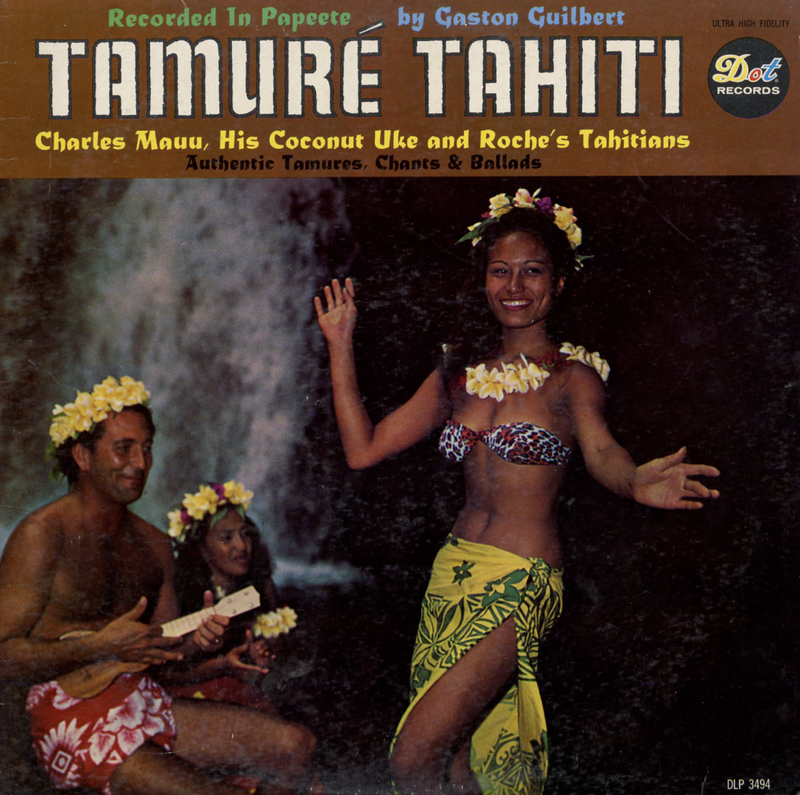 Budget label, Rondo-lette produced a nice package even if the bright, glossy cover art doesn't visually represent or market the set any better than the back cover illustrations or copy. 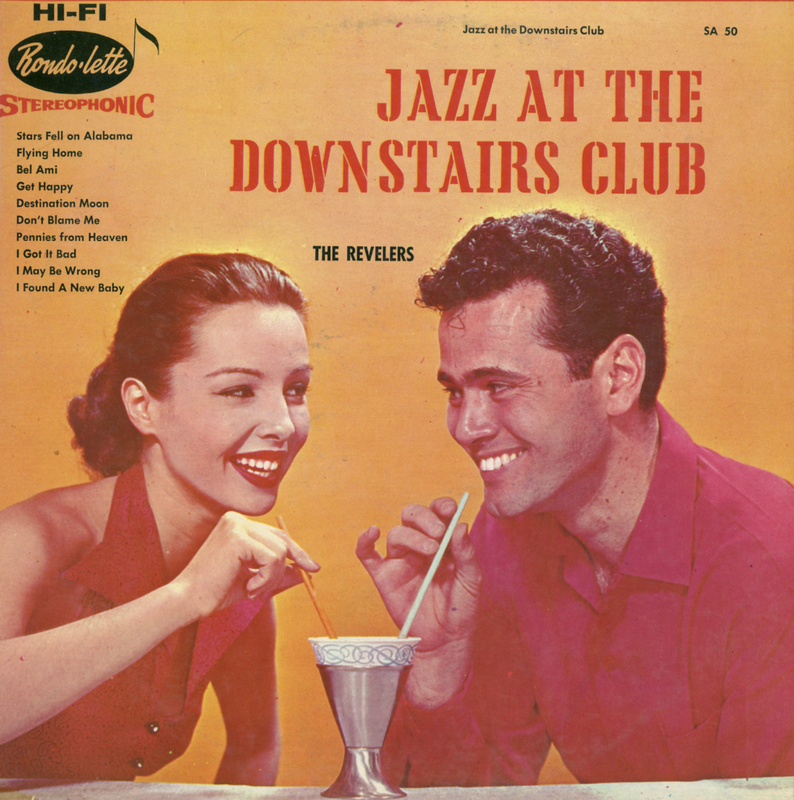 Whoever "The Revelers" might have been, they produced an excellent small combo/lounge piano driven jazz set. A Division of Mercury Records Productions, Inc.
From Billboard - June 10, 1967: The Wanderley organ gives something fresh to this album of bossa nova numbers and, at the same time, establishes him in the ranks of Jobim and Getz. 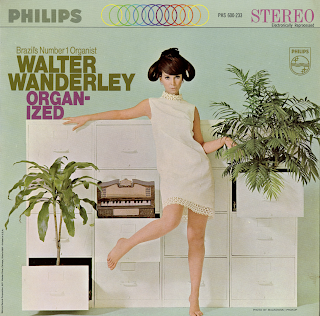 This LP should make it big in both the pop and jazz areas. 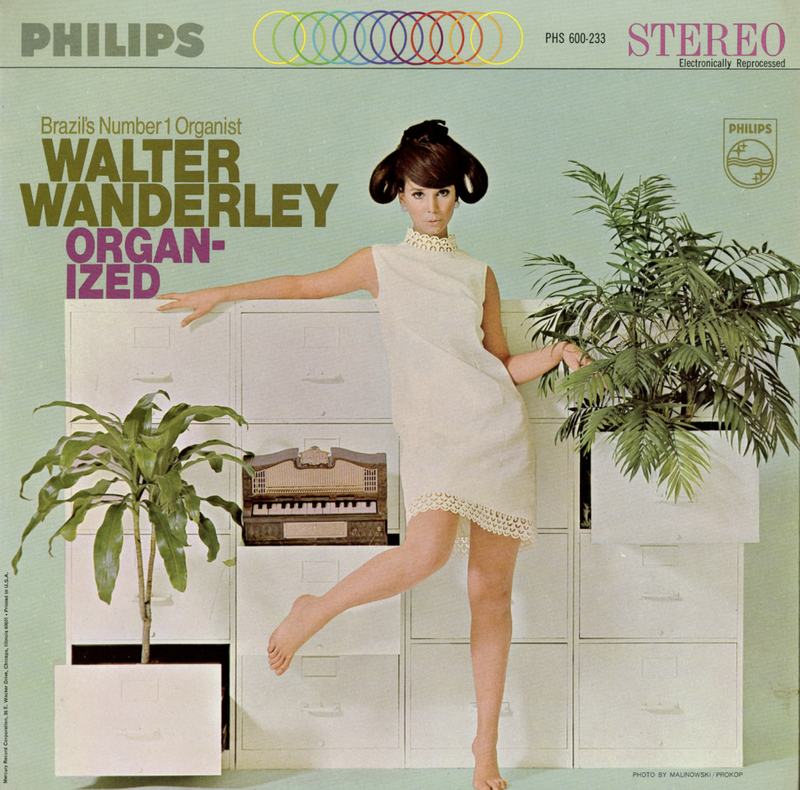 The Brazilian organist does a remarkable job on "Summer Samba," and all the other songs. From the back cover: The cover on this album was photographed in the mountains about 10 miles from Papeete, and was so remote that only Gaston Guilbert knew the way, through all the members of the troupe were natives, except yours truly. The girl dancing was a chef at a local hotel who worked as a model for the day. She was one of the best dancers of the "tamure" in addition to being pretty. About 6 months after this picture was taken, she was chosen to star in the Mutiny On The Bounty. This girl is Tarita. Budget label compilation set featuring no artist credits. 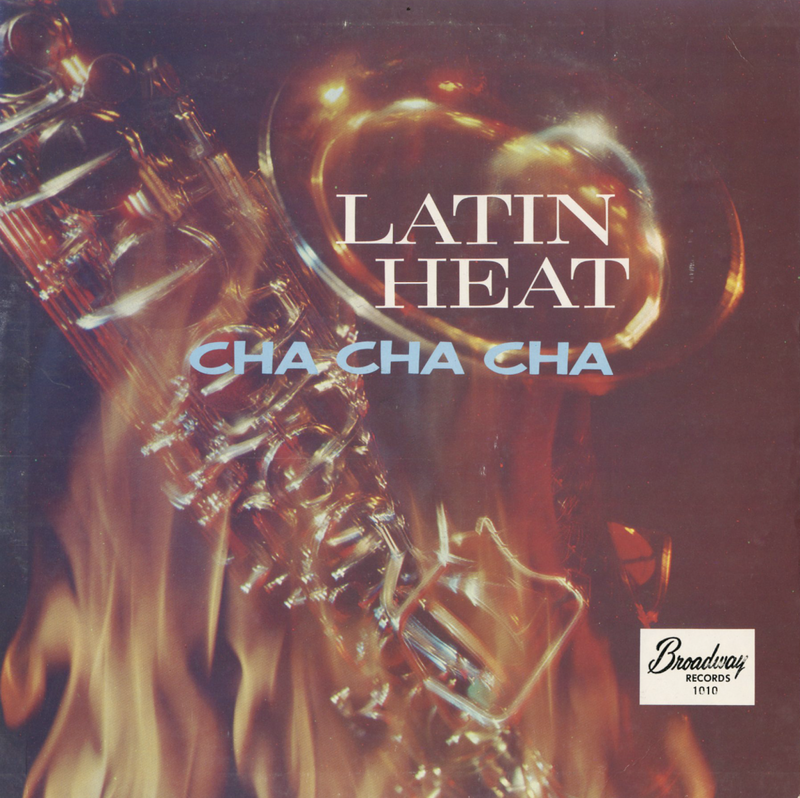 Tunes from this set can be found on a number of other budget cha cha collections, including: Cha Cha For Swinging Partners - Celebrity Records UT-127.